This was gonna be it. This was gonna be my revenge. For all the slightly too loud talk with a little bit too much TMI. For all the ice crunching and nail clipping and shoe stripping. For all the times my jokes weren't laughed at - I mean, I'm not always funny, but be a little polite, ok? For all the burned popcorn and odd smells and perfumes and other scents, whether from something mass produced or from something...rhyming with what I just wrote. Yes. I was gonna microwave Trader Joe's Sriracha Shrimp Bowl for my lunch at work, right in the central break room. I was going to parade it proudly back to my desk, as the aroma of nuked seafood and various spices would waft around the cubicle farm. I try to get along as best I can....but today would be different. Revenge, in this case, would be a dish best served hot. Too bad it didn't quite turn out that way. 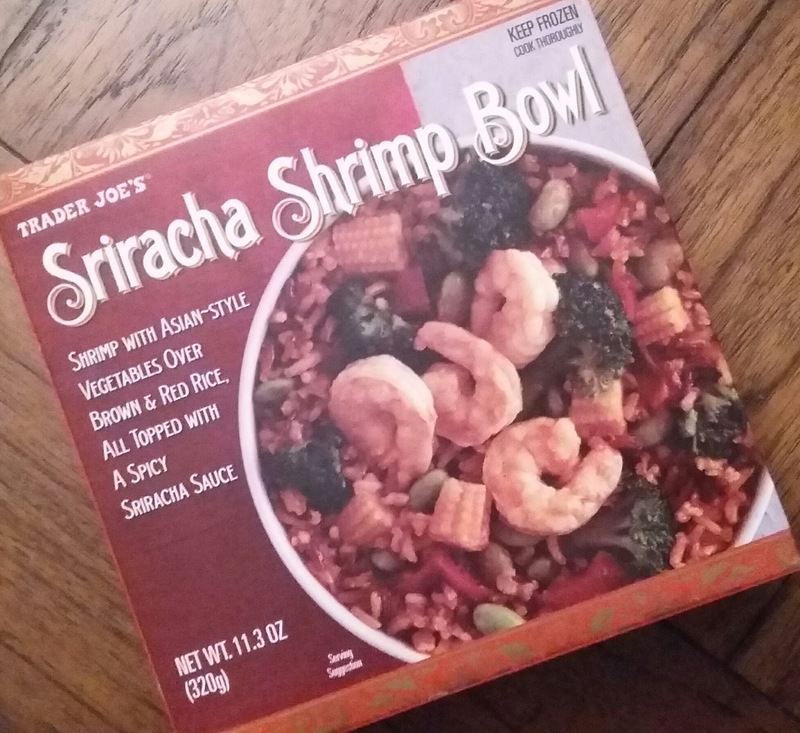 Surprisingly, this spicy shrimp and rice bowl is not overly aromatic, whether from a seafood or a spice perspective. It's almost completely innocuous. I don't think a single coworker noticed. No one asked. No glares. No nothing. I just looked like a dude eating lunch at his desk. Overall, it makes for an okay lunch. For $3.49 you can't expect too much, so that's how I'm trying to approach this. The biggest issue seems to be the shrimp itself. My bowl had five in there, which seemed to be a reasonable number. But the shrimp just didn't taste all that great, mostly because it wasn't seasoned, and the sauce didn't have a chance to really flavor the shrimp either. The result was every bite with shrimp had a big, fleshy, taste-tempering feel that wasn't too spectacular. Everything else was about on par, though. Mostly brown with a few red grains spinkled in, the rice added a hearty, earthy bite, while the veggies remained steamed yet firm enough. And the sriracha was about what one could expect, and it definitely helped tie it all together, too. I'm not sure if this says more about me or the dish, but one letdown was, only about an hour after eating it, I was kinda hungry again, enough to consider running downstairs to our work cafe for chicken fingers or something along those lines. I'd definitely advise not considering thes hrimp bowl to be an entire lunch in of itself, but pack along some fruits or veggies or something to help complement it all. 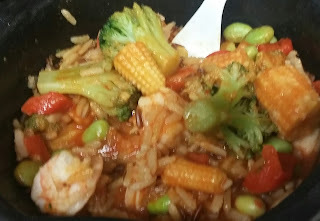 Good chance I'd buy this TJ's rice bowl again. There's only so many times I can eat leftovers per week, and I certainly can't buy/order out every day...unlike most of my coworkers...but that's another story. Just me grading it this time around, so gonna double up. Through extensive experience (my desk was unfortunately very close to the office kitchen) I believe that salmon wins for the Hot and Fragrant Fish Award. Even better if you just bring a frozen piece of raw salmon and then proceed to literally cook it in the microwave. I discovered a while back that if i flop said hot prepared meal ontop of a big bowl of baby spinach that adds some veggies, wilts a bit, catches all the stray sauce and keeps me full longer. And meal without the magical protein/fiber/fat combo leaves me hungry!